As you must have noticed, the screenshots that you take on your Mac are saved to the desktop. 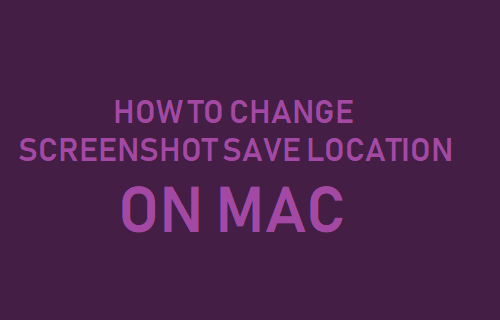 However, if you want to, it is possible to Change Screenshot Save Location on Mac. While the default setting on Mac is to save Screenshots to desktop, the Screenshot Tool on Mac offers multiple in-built save locations for Screenshots. All that is required to Change Screenshot Save Location on Mac is to click on the Options button in the Screenshots Tool and choose from the following Screenshot Save Options. Desktop: This is the default option that saves screenshots to the Desktop on your Mac. Clipboard: Saves Screenshots to the clipboard, which allows you to paste Screenshots into other Apps. Mail: Automatically opens a New Email with the Screenshot attached. Preview: Opens the Screenshot in Preview App, allowing you to Edit the Screenshot, before saving it to your Mac. Messages: Automatically opens a New Message, allowing you to send the Screenshot right away to any of your Contacts. Follow the steps below to change Screenshot save location to a specific folder on your Mac. 1. Open the Screenshot Tool on your Mac by pressing Command+Shift+5 Keys. In case you do not like using keyboard shortcuts, click on the Launchpad icon > Others Folder > and then click on the Screenshot Tool icon. 2. 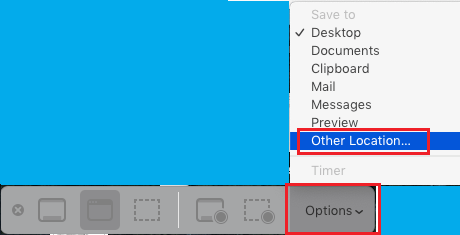 On the Screenshot Tool, click on the Options button and you will see multiple options to save Screenshots on Mac. To Save Screenshots to a specific Folder, click on the Other option. On the next screen, select the Folder into which you want the Screenshots to be saved on your Mac. Once you choose any of the above settings, your Mac will remember the setting and use it for all the Screenshots that you take on your Mac.